We offer Crowns/ Bridges as one of our services here at Healthy Body Dental in Clearwater FL off US Highway 19N. Do you have a missing tooth, or gaps in your smile? When you lose a tooth, it makes it difficult to chew or bite your food. It can also effect your speech and even case other teeth to drift out of place. 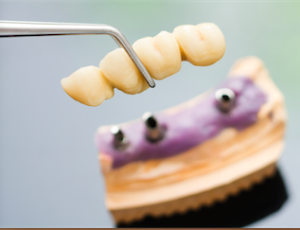 Dental Crowns help preserve compressed teeth. Dental Bridges help close empty spaces caused by missing teeth. Crowns maximize the appearance and function when a tooth /or teeth have lost or never had ideal appearance and functionality. Many different materials from plastics to metal to glass are used. We support the use of porcelain which has sufficient strength and unparalleled beauty. We also believe it is best energetically to use as little metal in the body as we can. Dental Bridges just like the bridges which span the banks of rivers, span the space between teeth when the space of a tooth or teeth is missing it can over time damage your other teeth and overall bite of your mouth. It is an option competing with implants or removable dental prosthesis. Bridges are an excellent choice most of the time. However many factors such as the condition of the teeth on either side of the space, the bone support, overall patient oral health, oral hygiene, doctor experience and skill, patient financial ability are all important factors. Loss of teeth has been associated with poor health and shorter life span. Again we like the use of porcelain and avoid metal if possible. If metals are necessary, the type of metal absolutely makes a difference to your oral health which affects your whole body. Dr. Tony Adams is without a doubt the best dentist I ever had! He’s done extensive work on my teeth including crowns on all my upper teeth, and they look terrific. On a personal note Dr. Adams is extraordinarily caring, intellectually gifted and spiritually conscious, a special human being. When I was 65 years old, I came to your office with a broken front tooth. I also had 2 upper side teeth missing. Note a very pretty sight. You made 5 crowns with a bridge for the two teeth between them. It made my smile look like a teenager. Over several years, 4 more crowns and a gold overlay added. Did I say I was 65 years old back then? Well last week I became 85 years old, and people still say to me “you have a beautiful smile.” Thank you Dr. Adams – PS Your nurse does a beautiful job cleaning teeth also.